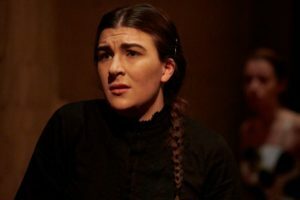 Powerful, atmospheric and engaging – this sums up the production of The House of Bernarda Alba at the Cervantes Theatre last night. Set in Spain in 1930s and banned there until 1963, Lorca’s play tells the story of a controlling Matriarch and her five daughters. The control she exerts over the girls goes beyond reason until it finally ends in tragedy. 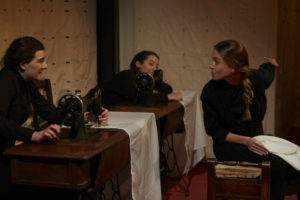 Mary Conlon’s performance as Bernarda exudes a dark control as she becomes increasingly concerned with reputation, duty, status and what the local community will think about her five daughters. Tension mounts as the play moves forward and is enhanced by atmospheric sound effects such as male voices and church bells. Set in a devoutly Catholic country, the sound of a tolling bell is both ominous and doleful. In addition, like the other effects used it represents the outside world which the girls are not part of. Indeed, the claustrophobia of their lives trapped with their mother, who prevents them from any kind of freedom, is almost palpable as is the sexual frustration they all experience. This is cleverly portrayed by the manic sewing they undertake, ironically of their wedding sheets, which will never be used. The link between the world inside the house of Bernarda Alba and the outside, is the housekeeper played by Moir Leslie. This role is convincing and whatever humour there was in this play, was carried by Leslie’s dry delivery and honest acknowledgment of the truth. She is the all knowing eyes and ears of the house issuing warnings from the onset in an utterly convincing, if not slightly sinister way. 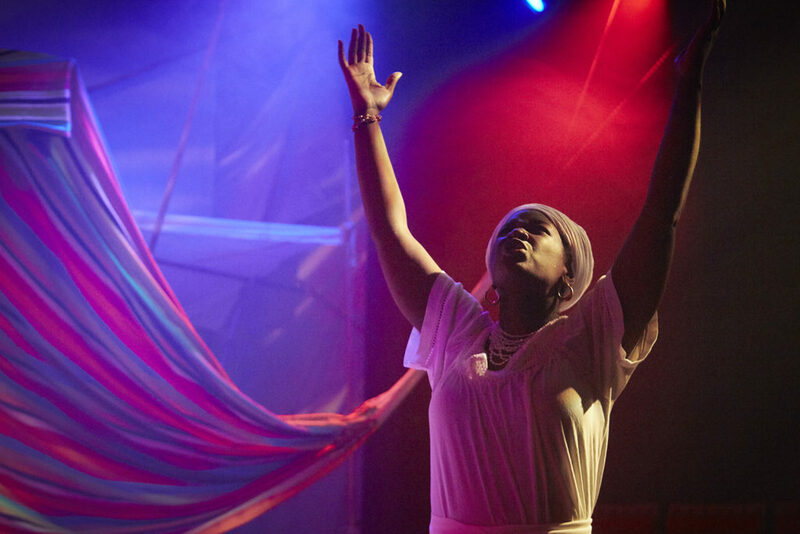 Of the five daughters, Pia Laborde as Amelia stood out because of her vulnerability and unpretentious performance. Beth Smith as Martirio is also worthy of note sustaining a convincing hunchback throughout. The stripped back set created the interior of a Spanish house simply by the suggestion of terracotta tiles. This created the desired effect along with simple white walls and two sewing machines. Both the set and lighting gave the impression of intense heat which, combined with the themes of sexual tension, created an interesting dynamic. In the words of the play ‘to be born a woman, is the worst punishment’. Lorca’s portrayal of these women certainly appears to be just that. Personally, I could do without any more plays involving the role of a ‘hysterical female’. It’s boring, tedious and old fashioned. Overall, however, excellently directed by Jorge du Juan with great performances from throughout.